I’m not all bacon-freaky; in fact, I almost never eat it. I almost never even eat meat, even. But this is what happens when I’m thumbing through my favorite food magazines (December issues, of course) to find that perfect add-on appetizer for a party I had been invited to. That’s right; I said add-on. Here’s why: I’m a food blogger. If you ask me to come to your party, I will come, but first I will ask you if there’s anything you would like me to bring. If you answer yes, followed by the genre of food I should bring, it’s game on. I don’t know what comes over me. It’s like I’m competing with myself to bring the best appetizer. I get pretty dumb about it, and it’s a little embarrassing. And I won’t ever just make one thing like you asked me to make, oh, no no; I will make you taste and quite possibly color-coordinating, complementary appetizers that sing with each other and solo. I will dig out archived issues of ever single food magazine ever written in or around december searching for that perfect combination of things i can bring to your party. By the way, I will act like it’s just something I threw together without thinking about it. You will know I’m lying, but I’ll do it anyway. This year, someone made the grave mistake of saying i could bring an appetizer to a party. I made them three appetizers; a symphony of flavor, if you will. I whipped up an old favorite baked crab dip recipe – very retro, very delicious, oddly perfect for winter and summer get-togethers – and served it alongside fresh-toasted crostini slices. Should the crostini slices become bored with just the crab dip, I also made a tomato-basil bruschetta topping to serve up on them. So hot and cold appetizers, one theme; bread. But i wasn’t done, because I brought with me the hit of the party; bacon candy. Evidently all you really need to do to make a splash is throw some thick-cut bacon on a baking sheet, slather it with brown sugar and a little chile powder, and pop it in the oven for a few minutes, and voila; you’re a party hero. And, oddly enough, it goes really well with both the tomato-basil thing and the crab dip thing. Imagine the possibilities. I know that’s what you’re doing. Bacon fans, you’re welcome. Bacon naysayers, I’d try this before I dismissed it; like I said, I’m not big into bacon, and even I loved it. The bacon gets a hard, glaze-y shell on it that makes it hard to resist. 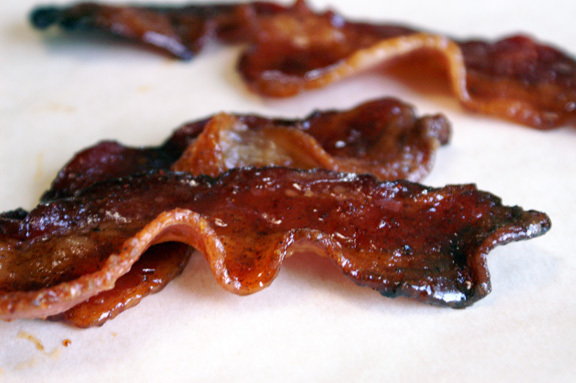 Are bacon things a total food fad? Kind of. But ’tis the season for kitsch, so…here you go. PS: It was dark when I made the crab dip and the tomato basil bruschetta toppings, so between that and not really paying attention to measurements, I can’t post them yet. When I remake them, I’ll share the recipes with you; they’re two of my favorites. Adapted, but barely, from a recipe found in one of my favorite and most relied-upon food magazines, Food & Wine, December 2012 issue. You can find the recipe here. I plan to mess with it further in terms of flavor, but this is not to say that it’s not perfection as it stands. Preheat oven to 400˚F. Line two lipped baking sheets with foil. Take that instruction very, very seriously, unless you’d rather spend your time cleaning bacon remnants from your baking sheets for the next 3 1/2 years. If you can, use heavy-duty foil, and make sure it goes up and over the sides. This is messy, so do your best to prepare. In a small bowl, whisk together the brown sugar and chile powder with a fork until evenly distributed and all brown sugar lumps are out. Arrange your bacon strips on pans, flush up against each other but not overlapping; their closeness will give you less burnt sugar runoff. Spoon your brown sugar mixture onto the bacon using a regular spoon, staying towards the center. I found the best way to do this is to spoon little mounds on to the bacon and then flatten it down onto the strips using the back of the spoon, spreading it along the bacon as you go, until each piece is evenly coated. 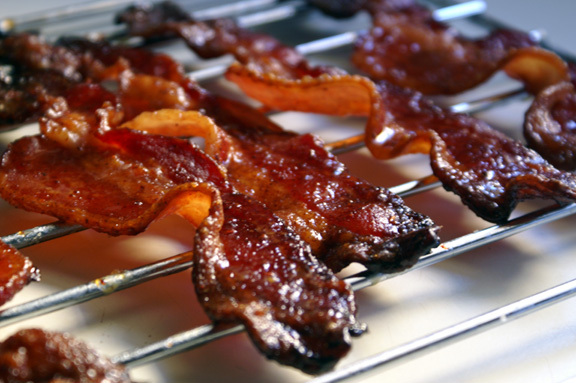 While your bacon is baking (and yes, i’m telling you this ahead of time), get out two metal cooling racks and place them on your counter, overtop some paper towels. Bake in the oven for 18-22 minutes, checking at the 15-minute mark and watching like a hawk from that point on. Why? Because you’re basically making caramel in the oven, and it can and will get darker and burn. What I saw on mine is the edges go first; the bacon fat pools and stays where the bacon is highly concentrated, but the empty edges, where the fat has nothing to run up against, will darken. This, amazingly, tastes fine, and not burnt. Every pan is different, though, and so is every oven, so watch for your bacon to stay this gorgeous deep red color towards the centers and darker at the edges. Take it out when it is almost crisp and the sugar is caramelized. Remove the bacon from the oven and transfer the pieces to the wire racks using a pair of good, sturdy tongs and a fork (to hold the other end of the bacon so it’s easy to lay down flat). Some will try and stick together, but you’ll have less of this if you work quickly and do it right away. Be careful, as you’re dealing with flaming-hot caramel bacon. The bacon will crisp up more and get caramel-firm as it cools. You don’t have to serve these immediately, which is great, because it gives you a little time to clean up. I made these several hours ahead of time and they were incredible. 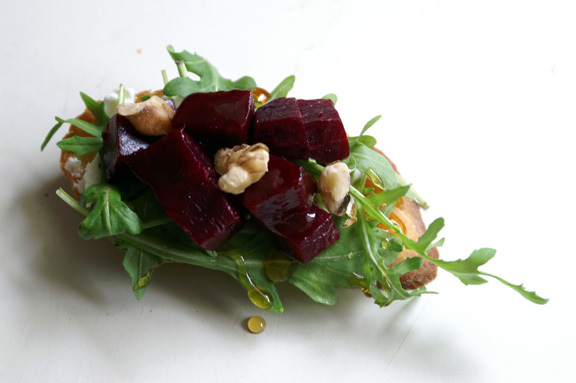 monday bites: roasted beet, arugula, + goat cheese crostini. 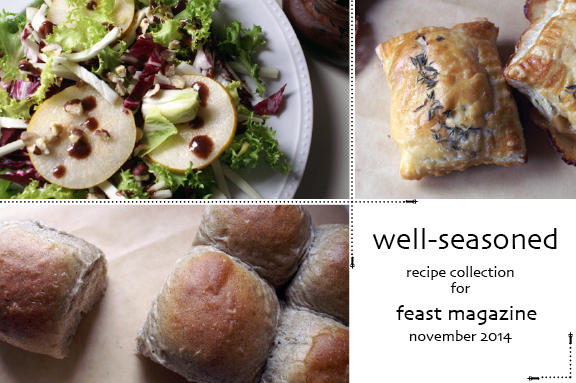 well-seasoned, part one: pastry pockets, a winter salad, and dinner rolls. Is that bacon in a…test tube? See, this is why I love you. Because who else would bring bacon in a test tube. Also, Linda says she loves you too. Because you made bacon candy and all. 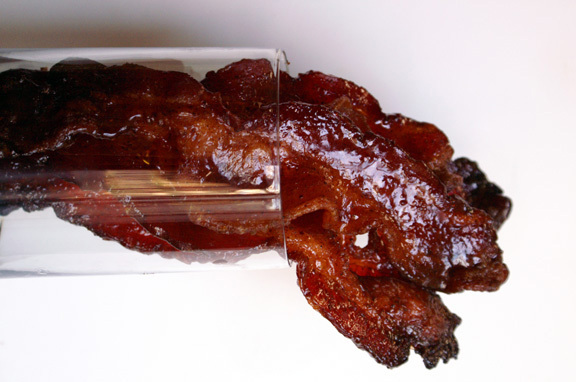 I would totally bring bacon in a test tube though. or at least a beaker, if i couldn’t find a big enough test tube. you need to make these STAT for linda. STAT, i say. On our honeymoon we had an appetizer in Hood River, Oregon at this great restaurant called Nora’s Table. The dish was made up of roasted root veggies, which had then been chilled, tossed with a delicious vinaigrette and served over arugula…with candied bacon on top. It was the first time I’d tried bacon candy and Nate and I could not stop commenting on how seriously amazing it was. It’s a dish I’ve been wanting to reproduce but haven’t gotten around to it yet. But now that you’ve given me the perfect recipe for the bacon candy part, maybe now’s the time! this is maybe the best trading-recipes comment ever. Because now i want to create this gorgeous root veggie/vinaigrette toss on arugula; that sounds phenomenal! I bet this would be great on that…just sweet enough to offset the vinaigrette and the peppery arugula. You could even leave the chile pepper part out if you wanted to go for a straight bacon candy/no spice thing. Yikes, I think ‘flaming hot caramel bacon’ has a future with me! yay! “flaming hot caramel bacon” has a nice ring to it, right? i can’t believe you, of all people, have not made candied bacon. i’m shocked; i feel like this is, yes, a MUST MAKE THIS NOW thing for you. You would LOVE it. i’m thinking of somehow incorporating it into a cookie…something about the sweet/salty of it is begging me to do that. Um, I’m sold. Candied bacon will be made and devoured. With extra chile powder, for sure. As for rifling through the cookbook, magazine, blog, and other assorted recipe archives to find THE perfect dish….I do that too. A lot. I probably spend just as much time (if not more, oops) researching rather than cooking. But I agree with you. It has to THE ONE. And I just have to make it seem effortless. If it’s the hit of the party, like your amazing candied bacon, then bonus points! YES! I knew you’d be on board for the bacon, Ashley. And the rifling, right? I’m a researcher at heart; for as long as i can remember, my favorite part of writing papers (I’m an english major, so I had lots of them) in school was the research part, which took easily 80% of the start-to-finish process time. Put me in a library with things to discover in books/magazines? I’m ON IT. 🙂 I’m probably guilty of more research than cooking, but is that so bad? I think not, because you sort of “test” the recipe in your brain without having to make it 6 times. ooooh chili recipes! you know, you can research those to death, too, because there’s so many out there with different little twists to them. I have a handful of favorites, including one i just made to post on the blog soon – andrew carmellini’s lamb chili with chickpeas and a cucumber raita, SOOOOOOO good i can’t even put it into words, and the raita totally brought the flavors together. You know I worship that man. I made it with turkey as a “lightened up” version, but it was so crazy delicious that i’m going all out with lamb next time, and i’m pretty sure it’ll blow my socks off. 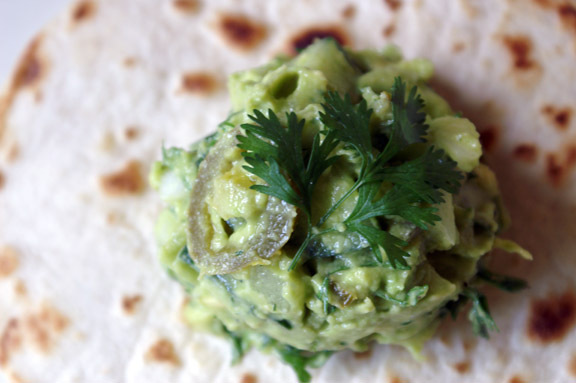 For a spicy/hot chili, i have always modified this one recipe from Guy Fieri (i know, right? who would have thought, but he can rock some chili) and I love it – lots of layers of flavor, intense heat, but not the kind that dulls your other senses either. I’m in for kicking this around with you; we’ll talk. i’ll keep an eye out for other ones that look amazing, and I promise to post the one Carmellini lamb recipe soon.